1. Honor in defeat. 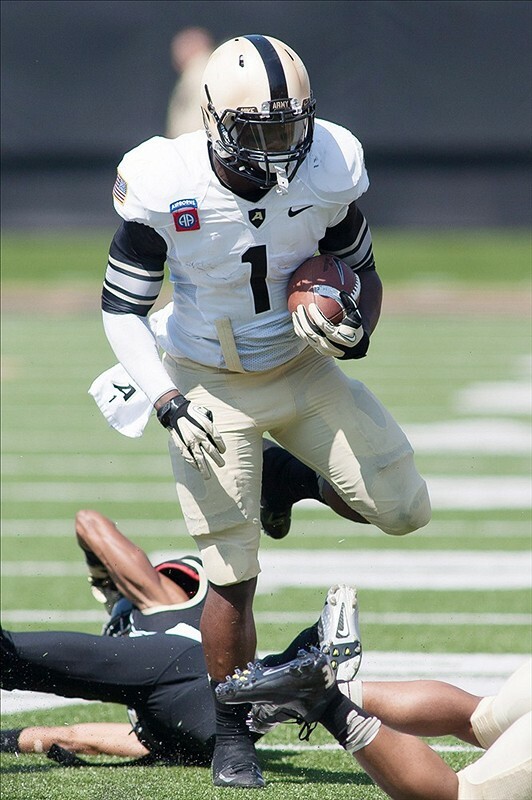 Army junior running back Raymond Maples set the stat book on fire Saturday at Wake Forest, but his 140 yards rushing on just 15 carries (plus a receiving touchdown) weren’t enough to prevent a 49-37 loss — Army’s third straight. It was enough to earn him offensive player of the week honors among football independents. 2. Ground game update. Maples is also sixth on the Football Bowl Subdivision rushing list, averaging more than 135 yards a game. Air Force senior Cody Getz is second, checking in with almost 154 a game. Other academy players in the top 100 include Army sophomore Larry Dixon (41st, 94.0 ypg) and a pair of senior quarterbacks: Air Force’s Connor Dietz (87th, 67.7) and Army’s Trent Steelman (T-92nd, 67.0). 3. Steelman’s status. The senior quarterback injured his ribs late in Saturday’s loss, returned briefly, then went out for good about halfway through the fourth quarter. His status is unknown for this Saturday and beyond, reports Army football guru Sal Interdonato. As Interdonato points out on his blog, the offense veers from the traditional triple option when sophomore Angel Santiago takes over behind center — with less-than-promising results. 4. Air Force loses lineman. Army has its share of injuries; Air Force is leading the academies in illness. Offensive tackle Jason Kons may miss a month thanks to a case of mononucleosis, according to The (Colorado Springs, Colo.) Gazette. The senior missed Saturday’s 38-35 loss to UNLV. 5. Air Force loses, period. The Falcons were up 28-17 before things got ugly. 6. Any good news? Navy earned its first win of the season, downing Virginia Military Institute 41-3. 7. About that … The Mids didn’t stop making mistakes, with two fumbles from quarterback Trey Miller and seven penalties. Miller did manage three touchdown runs, however. Navy’s second-to-last in turnover margin, ranked 119th out of 120 FBS teams. 8. More rankings. Air Force head coach Troy Calhoun makes his top-25 list public throughout the season, unlike other coaches. See it here. As the USA Today folks point out, he may be a bit more generous to Michigan (2-2) than the rest of the voters — the Wolverines are out of the top 25 in both major polls, but Calhoun ranks them 20th in the country. He probably has his reasons. 9. Big East update. The Bowl Championship Series moves to a four-team playoff after the 2014 season, but it still will select teams to play in other BCS bowls. That group of bowls, according to a Wall Street Journal report, could be expanding. Good news for the Big East, as it increases the odds of a conference title-winner reaching the big-money postseason. And as the Big East goes, so could go all the academies. 10. Homecoming. Looking ahead to this Saturday (all times Eastern): Army hosts Stony Brook at noon (CBS Sports Network); Air Force hosts Colorado State at 2 p.m. (Altitude network); Navy hosts San Jose State at 3:30 p.m. (CBS Sports Network).